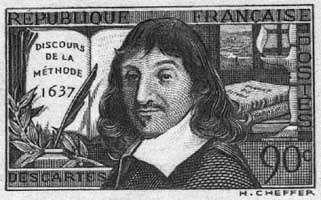 "If you would be a real seeker after truth, you must at least once in your life doubt, as far as possible, all things" declared René Descartes in his Discourse on Method. Through his system of doubt, Descartes achieved numerous accomplishments in many areas. He is solely responsible for reviving the field of philosophy, which had reached a state of inertia by the sixteenth century. He deepened understanding of meteorology and optics. He also originated what would later be called Cartesian Coordinates and Analytic Geometry. René Descartes was a singular man who contributed much both in science and philosophy to The Enlightenment. Descartes’ contributions to philosophy, the sciences, and mathematics did not begin until 1628, when the self-described "thinker" was thirty-two years old. Earlier in his life he stayed in bed until noon, and spent most of his time simply thinking. He was able to exist without ever working. His private income came through a legacy from his mother who had died a year after his birth. He was brought up by a nurse, and had no contact with family. He felt this lack of love and certainty all his life. It caused him to search for things that were constant. In school, it struck him that the philosophy and science he learned were based on things others had assumed. Nothing was certain except mathematics. This led to his mathematical approach to philosophy and geometry. He sought to deduce principles only from facts he had established himself. He was dissatisfied with life and had a need for certainty, both of which inspired him to search for truth. Although Descartes was born in La Haye, France (now called Descartes), he did nearly all of his work in Holland. He settled down there after years of traveling and being part of various military forces. Though he stayed within Holland, he was still very restless (a proof of his continuing dissatisfaction with life). In one twelve year period, he lived in fifteen different houses. He chose Holland because it was a safe-haven from the Church for philosophers with radical ideas during the Renaissance. Descartes certainly had ideas that conflicted with the Church’s beliefs. His first work, A Treatise on the Universe, defined his beliefs on how the universe worked. They were very similar to those of Galileo. Near the time the work was completed, Galileo went to trial for heresy. For this reason, Descartes chose not to publish. His work was only published twelve years after his death. Historians believe there is little that is unique in this work. Much is borrowed from previous mathematicians and scientists, though Descartes does not mention his sources. The main item of importance is his theory on automatic response to external events. He proposes a system of impulses similar to what we know the nervous system to be today. Because of this hypothesis Descartes is generally credited with founding the reflex theory. In the next work he wrote, A Discourse on Method, Descartes did the majority of his most brilliant thinking. In it, he came to his famous conclusion, "I think, therefore I am". Before writing this work, he had developed a method for discovering truths: one should draw conclusions only from truths one already knows. Then one can use the facts one has previously inferred to prove more certainties. To have any truth from which to infer, though, one needs to start from not believing any predetermined knowledge. This ensures that one is not taking anything as true without first proving it to oneself. To do this, Descartes doubted that anything was real, that all life was a mere hallucination. He found that the one undeniable reality was that he was thinking. If he was thinking there must be a thinker; he thought, therefore, he was. He built from this to prove the existence of God and of the whole universe. This method later became known as Cartesian Method, after Descartes. Though all of his "proofs", except for that of his existence, have been shown faulty, his method remains valid. It is what differentiates modern philosophy from classical. Descartes wrote three appendages to A Discourse on Method. They were Dioptics, Meteorology, and Geometry. In Dioptics, he delineated the laws of refraction, and some principles of a telescope. In Meteorology, he fairly accurately explained rainbows, and became the first to use science to predict the weather. In Geometry, he did his most lasting work. He originated the idea of objects being at a point in space that could be fixed on a graph as in (x, y, z). He also developed what is today called Analytic Geometry. Loosely defined Analytic Geometry is the application of Algebra to Geometry. Both are used commonly today. In another work, Meditations, Descartes explored the relationship between mind and body, and how they affected and interacted with each other (today called Dualism). He contributed to metaphysics by starting the sub-field of Dualism. Descartes conjectured that the body and soul were connected at the pineal gland, which is at the base of the neck. He incorrectly thought that only humans had this gland and that through it the mind and body made contact which resulted in awareness. Descartes’ most comprehensive work was his Principles of Philosophy. In it, he gave us his theory of vortices. Though Newton proved Descartes’ theory of vortices to be completely erroneous, it was brilliant at the time. He endeavored to explain how the planets moved in their orbits. He stated that in the beginning one object was moved (this movement was initiated by God) and the subsequently it’s movement caused the movement of everything else in space. This was a predecessor of the "String Theory". Descartes produced various theories, which were brilliant, but were later disproved. However, he did make enduring contributions to the areas of mathematics, optics, meteorology, and philosophy. He gave civilization Cartesian Coordinates and Analytic Geometry which have enabled further development of geometry. He elucidated the laws of refraction. He instituted the practice of using science to forecast weather. He restarted the dead field of philosophy and gave it his method for determining truth. The Enlightenment owes a lot to this remarkable man.